For a lot of us, the bane of our teenage years, aka acne, comes back to haunt us in adulthood more often than we’d like to admit. Around 80 percent of people from puberty to age 30 struggle with some sort of acne. Zit-covered (and so over it), we found ourselves on a journey to discover the best possible solution, and somewhere along the way, we wondered about birth control. So can it actually help with acne? Below, a dermatologist weighs in on birth control and its impact on breakouts. According to Dr. Yoram Harth, a board-certified dermatologist and medical director of MDacne, “hormonal imbalance is one of the leading causes of acne.” Harth explains that three primary hormones are involved in this process. “Testosterone is a male hormone (androgen) that is produced in both men and women. In high levels, testosterone increases the size of the skin oil glands and the sebum production (oil) in the skin,” he says. “When the oil glands in the skin grow, they are frequently clogged by dead skin cells, leading to overgrowth of acne bacteria, more inflammation, and more acne.” Progesterone and estrogen are produced only in women, but progesterone’s effects can mimic those of testosterone to increase breakouts. Harth’s birth control recommendation for the average acne sufferer? “Taking birth control pills that contain both estrogen and progesterone lowers the number of androgens in your body,” he says. 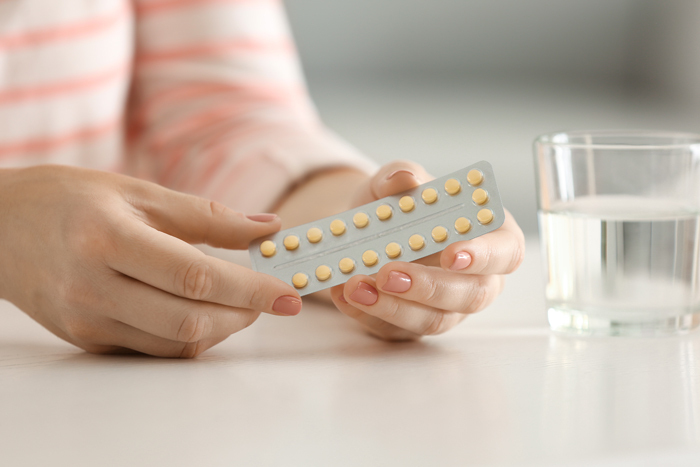 “The best birth control pills for women with acne typically contain at least 35 micrograms of ethinyl estradiol and progestin with a low androgenic effect.” Regardless of its form or impact on other menstrual symptoms, not all birth control is created equal. “Birth control pills that contain only progesterone can make acne worse,” Harth explains. Whether or not your doctor determines that birth control is the right choice for your acne, knowing your options is the best first step. As always, be sure to consult your dermatologist or doctor with any health concerns. From adult acne to dealing with a UTI, women bear some serious struggles. To help ease the pain, doctors share their best advice for avoiding a UTI. BC really has worked for me. Especially with my acne, but it was a side benefit when I first got on it. I take BC for my migraines and because I was diagnosed with endometriosis at an early age. OF course, I am actually taking a lower dose than what is recommended on here, so I still get one or maybe two zits every 28 days or so.